We already deliver the coffee, why not let us deliver everything else for your kitchen too? 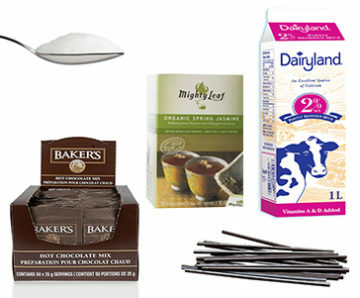 Wosks Coffee Service stocks thousands of items including dairy, sugar, tea, cups, stir sticks, cleaning supplies and more! Be sure to browse the categories below for items that will make your day a little bit more enjoyable. We already deliver the coffee, why not let us deliver the dairy too? We already deliver the coffee, why not let us deliver the dairy too? Made fresh daily from local farms, Dairyland has been a delicious part of your day for over 90 years. Balance out your coffee with a variety of sweeteners. Satisfy your sweet tooth with a wide variety of specialty drinks. Satisfy your sweet tooth with a wide variety of specialty drinks. We carry several options in the single serving envelopes to satisfy all choca-holics as well as bulk bags for use in a single cup brewer. Browse through our abundant selection of refreshments for your staff, clients and boardroom meetings! Open the doors to your office pantry with many items to choose from! Wosks Coffee Service can make sure that no one will ever be left with an empty stomach. From oatmeal to breakfast and from soups to nuts, satisfy every craving throughout the day. Indulge your taste buds with our robust selection of sweets and treats! Trust us...we can never find kitchen cutlery too. Stir sticks are either compostable or biodegradable! Cups of all shapes and sizes are available at Wosks Coffee Service to suit your needs. If you love cleaning as much as we do, then these products will definitely help get your office spotless! Keep your office space spotless with an ample supply of soaps, detergents, towels and many more!